Perhaps the most perplexing market-moving event of the past 48 hours, was the 1-2 punch of a Tuesday Bloomberg report that next Thursday's ECB meeting is "live" in that policy makers anticipate (at long last) holding a discussion that could conclude with a public announcement on when they intend to cease asset purchases (QE), coupled with a slew of ECB members overnight coming out with unexpectedly hawkish comments. Of these, the ECB's otherwise dovish Peter Praet said inflation expectations are increasingly consistent with the ECB's aim, and added that markets are expecting an end of QE at end of 2018, this is an observation and input that is up for discussion and that "it's clear that next week the Governing Council will have to make this assessment, the assessment on whether the progress so far has been sufficient to warrant a gradual unwinding of our net asset purchases." Other ECB hawks such Hanson, Weidmann and Knot doubled down on the central bank's sudden QE-ending jawboning pivot, saying that the ECB could lift rates before mid-2019 due to "moderately" rising inflation, that market expectation of end of QE by end of 2018 is plausible, and that the ECB should wind down QE as soon as possible. ... as well those of US Treasurys, but spiked the EUR while sending the USD lower, and unleashing today's euphoric stock surge. Now, it is hardly rocket surgery that without ECB support, Italian bonds are toast. 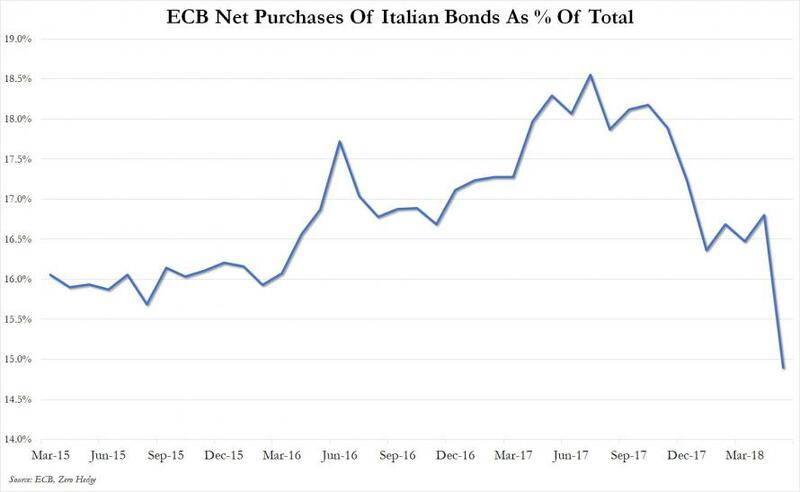 After all, as we have shown and predicted since last December, without the only marginal buyer of Italian debt for the past 2 years - the ECB - Italian yields would soar, leading to a prompt default by the nation which would suddenly find itself drowning under untenable interest expense. ... while boosting its Bund purchases. Needless to say, the Italians, especially the ruling populist coalition, were furious and claimed that Draghi was directly "manipulating" the market to slam Italian bonds and hurt public sentiment just as the coalition was being formed and threatened to place a Euroskeptic finance minister, something EU budget commissioner scandalously suggested last week when he said that "the negative development of the markets will lead Italians not to vote much longer for the populists", a terrible statement for which he promptly apologized as it was... the truth, and revealed that fundamentally the ECB is very much a political entity, and one which got Silvio Berlusconi fired in November 2011 in precisely the same way. 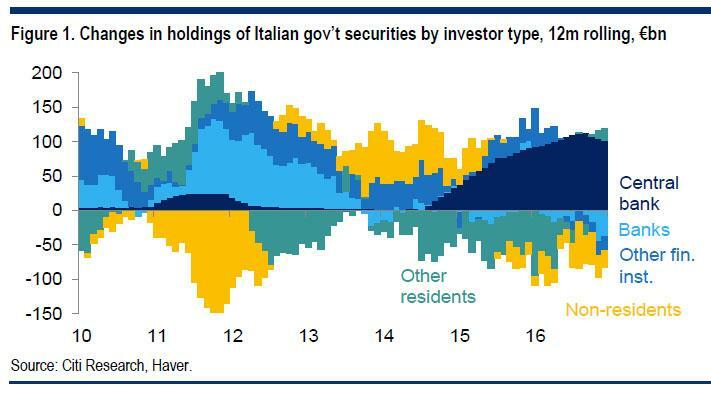 "yes, Italian bonds are massively mispriced and they will plunge if and when the ECB stops supporting the market, in effect holding Italy hostage. As for the biggest question, it is what if anything, Rome has up its sleeve to avoid such a fate when Draghi's QE finally ends." The answer, sadly for Rome, remains absolutely nothing, as without the backstop of the ECB's "whatever it takes" policy to keep the Eurozone together, the Eurozone would almost instantly fall apart (which ironically would be a welcome development for Italy, at least in part, as it would allow it to default on its debt in its own currency). And that is what many believe was what prompted the ECB's strange spectacle over the past 48 hours: the hawkish twist and the barrage of QE-ending comments by ECB members was nothing more than a lesson to Italy, demonstrating what will happen i) if Italy were threaten with leaving the Euro and ii) when QE finally ends... at some indefinite point. Or, as Bloomberg's Lisa Abramowicz said in a podcast today, it was the ECB "basically just giving the finger to Italy." Confirming as much, Anne Mathias, Global Rates and FX strategist for Vanguard, responded that "part of the vocal nature of the 'talking about the talking about' [the end of QE] probably has something to do with Italy, especially as they've been paring their purchases of Italian debt. What the ECB is trying to say is hey, "this is our party, and you're welcome to it, but if you're going to leave it's not going to be easy for you." The ECB is trying to show Italy a future without the ECB as backstop." A spot-on follow up question from Pimm Fox asked if this is "a situation in which the ECB is cutting off its nose to spite its face, because you can stick to rules for the sake of sticking to rules, but when you have a potential crisis, why wait for it to be a real crisis such as Italy, which the new government has pledged to spend a lot of money, to lower taxes, while they still have a huge government deficit. Why would the ECB do this." The brief answer is that yes, it is, because sending the Euro and yields higher on ECB debt monetization concerns, only tends to destabilize the market, and sends a message to investors that the happy days are ending, in the process slamming confidence in asset returns, a process which usually translates into a sharp economic slowdown and eventually recession, or even depression if the adverse stimulus is large enough. As for the punchline, it came from Abramowicz, who doubled down on Pimm Fox' question and asked if the "European economy can withstand the shock" of the ECB's QE reversal, which would send trillions in debt from negative to positive yields. 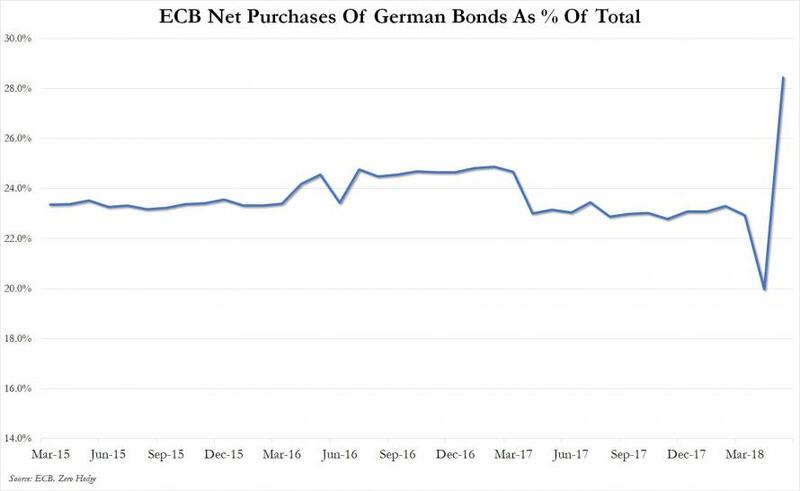 While the answer is clearly no, what is curious is that the ECB is actually tempting fate with the current "tightening" scare, which may send the Euro and bond yields far higher over the next few days, perhaps even to a point where Italy finds itself in dire need of a bailout... from the ECB. Then again, don't be surprised if during next Thursday's ECB press conference, Mario Draghi says that after discussing the end of QE, no decision has been made or will be made for a long time. At that moment, watch as the EUR and bond yields tumble, and the dollar resumes its relentless push higher. Listen to the 6 minute podcast at the following link.